We know the word surgery can invoke fear in just about anyone, and that it can be even more frightening when it’s preceded by the words oral or dental. However, we can assure you that Dr. LaBry will treat your dental woes with the gentlest care possible. Dr. LaBry devotes many hours to continuing education, and our team employs cutting edge technology in order to deliver high quality, compassionate care. LaBry Family Dentistry’s comprehensive service list includes tooth extractions, root canals, precision dental implant placement, and more! Get the care you need today. We know the idea of tooth extraction causes discomfort, but we’ll make the procedure itself as painless as possible. With a local or general anesthetic, it becomes a fairly routine treatment that passes more quickly than you’d expect. Use ice packs to reduce swelling. Apply them gently to the external areas of your face for 20 minute intervals. Avoid hard and/or hot foods and beverages for a few days. Swish warm salt water in your mouth 24 hours after surgery. One-half teaspoon of salt in one cup of water can inhibit bacterial growth. This may be done every 2-3 hours. Avoid smoking, spitting, and using a straw for at least 5 days after your extraction. These actions can cause dry socket, a condition that occurs when a blood clot has been dislodged. This can cause serious pain and delay your healing time. Because root canals don’t require scalpels or sutures, they’re not technically considered a surgical procedure. You’re more likely to hear the procedure referred to as endodontic therapy in the dental world. What are endodontics? It’s the branch of dentistry that focuses on the tissues and dental pulp surrounding your tooth roots, or literally, the inside (“endo”) of your tooth (“dontic”). 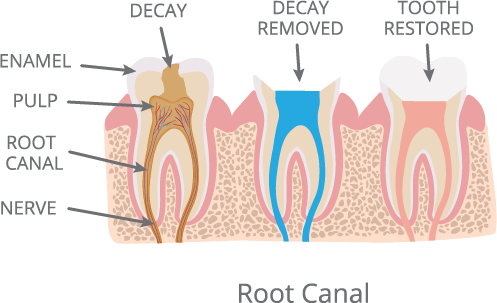 A root canal is performed when the nerve or pulp of a tooth has become infected or inflamed due to deep decay, cracks, chips, or trauma to the tooth. Symptoms of an infected tooth include pain, hot and cold sensitivity, and swelling. The sooner you can see Dr. LaBry for treatment, the better the outcome for your oral health. 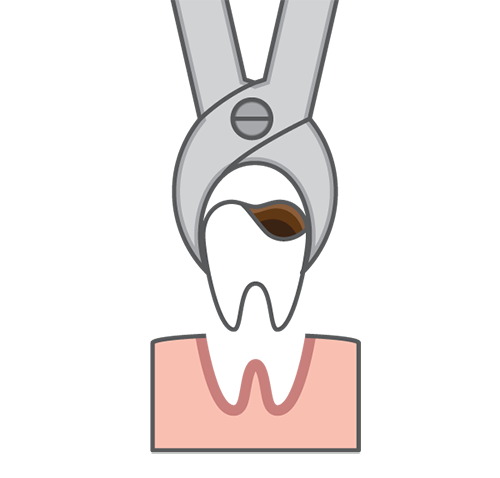 The process of a root canal starts with anesthetizing the affected tooth before creating a small opening to remove the infection. Once the infection has been removed, the opened roots will be filled to prevent further infection. Your root canal might conclude with a porcelain crown being placed to reinforce your tooth and restore its pre-infection shape and health. While this may sound like a painful process, over 14 million root canals are performed each year, with patients reporting that it’s no more uncomfortable than having a cavity filled. In fact, the pain of an infected tooth left untreated is more intense, and has consequences we don’t want you to experience. Let Us Bring Back Your Smile! If you’re in need of oral surgery in Broussard, you’ve come to the right place! We can provide all of your oral health needs under the comfort of one roof. If you have any questions or would like to schedule a consultation with Dr. LaBry, give us a call or request an appointment online today! Fill out a form and our team will get back to you the following business day. Please call us at (337) 385-3250 or fill out the form below to request an appointment. This is not a dental insurance plan. It cannot be used in conjunction with another dental plan or for service covered under workman’s compensation. This cannot be used for treatment which, in the sole opinion of the treating dentist, lies outside the realm of their capability. This plan cannot be used for referrals, hospitalizations, or hospital charges of any kind. It also cannot be used for cost of dental care which is covered under automobile medical.